The term Anthelion means “opposite the sun.” The so-named series in this show explore ideas that are “opposite” of the sun – darkness, fire, apocalypse and the unknown, coalescing into a foretelling of a darkened future. In a second series, Love Without Hope, the artist considers increasingly common wildfires as they relate to climate change, pollution, industry, and land use, finding beauty and evolving realities. 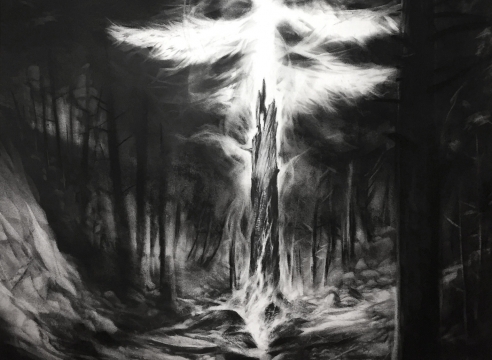 All works are charcoal and pastel chalk on paper and look at a potential near-future world, where the sun cannot be seen. Amory Abbott’s art practice reinterprets the romanticized sentiment of spirituality in nature by visualizing darkness and cataclysm in landscapes on the brink of transformation.